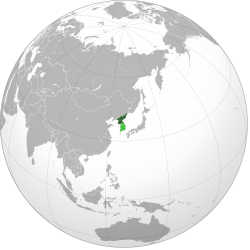 ↑ "Korea, North". Britannica Book of the Year 2014. London: Encyclopedia Britannica, Inc. 2014. प. 642. ISBN 978-1-62513-171-3. ↑ Petrov, Leonid (12 अक्टूबर 2009). "DPRK has quietly amended its Constitution". Leonid Petrov's KOREA VISION. 16 अक्टूबर 2015 के ओरिजनल से पुरालेखित. पहुँचतिथी 21 July 2015. ↑ "DPR Korea 2008 Population Census National Report" (PDF). Pyongyang: DPRK Central Bureau of Statistics. 2009. प. 14. ओरिजनल (PDF) से 31 मार्च 2010 के पुरालेखित. पहुँचतिथी 19 February 2011. ↑ "Turning back the clock – North Korea creates Pyongyang Standard Time". Reuters. 6 अगस्त 2015. 16 अक्टूबर 2015 के ओरिजनल से पुरालेखित.